Home > Departments > Faculty > Mark Turnbull Ph.D. 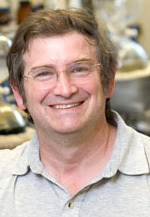 Professor Turnbull served as a visiting lecturer at the University of Canterbury, Christchurch, NZ in 1995, and as a visiting professor at the Universitat de Barcelona, Spain in 2001-2002. Our research lies in the preparation of new materials and is focused in two areas. Over the last two decades, a new field of research has emerged called molecular magnetism. The guiding principle is to use our understanding of structure, bonding and geometry to control the bulk magnetic properties of a material at the molecular level. This is highly interdisciplinary work and involves teams of collaborating organic and inorganic chemists, theoreticians and condensed matter physicists (our group works in collaboration with that of Prof. Christopher Landee in the Physics Dept. as well as several groups around the world, including Spain, Germany, Great Britain and New Zealand). The copper oxide-based high temperature superconductors have introduced a new era to the field of conducting materials, but the mechanism of their superconductivity is still not well understood. One theory suggests that the mechanism of the electrical superconductivity is relted to the mechanism of magnetic super-exchange in these compounds. We are working to prepare structurally related complexes which have more moderate ordering tempertures as models for these systems and others where the magnetic interactions are not principally propagatged in 3-dimensions. Of special interests are those materials where the magnetic interactions are not strictly one- or two-dimensional in nature, but whose topology may be described as inter-dimensional, such as ladders, honeycombs and rectangles. We have recently succeeded in preparing a large family of the best examples of magnetic ladders known (at right) and experiments are in progress to determine their properties and whether doping the systems will generate superconducting materials as predicted by theory. 206) †Hobson, A.D.; Konopacki, D.; Shortsleeves, K.C.#; Turnbull, M.M. ; Wikaira, J.L. Eur. J. Org. Chem. 2015, 5453-63. "Lewis Acid Catalyzed Cyclizations of Epoxidized Baylis–Hillman Products: A Straightforward Synthesis of Octahydro­ benzo[e]azulenes"
211) Lada, Z.G. ; Beobide, A.S.; Savvidou, A.; Raptopoulou, C.P. ; Psycharis, V.; Voyiatzis, G.A. ; Turnbull, M.M. ; Perlepes, S.P. Dalton Trans. 2017, 46, 260-74. "A unique copper(II)-assisted transformation of acetylacetone dioxime in acetone that leads to one-dimensional, quinoxaline-bridged coordination polymers"
213) †Krasinski, C.A. *; Solomon, B.L. *; Awwadi, F.F. ; Landee, C.P. ; Turnbull, M.M. ; Wikaira, J.L. J. Coord. Chem. 2017, 70, 914-35. "Copper(II) halide salts and complexes of 4-amino-2-fluoropyridine: Synthesis, structure and magnetic properties"
217) †Herringer, S.N.#; Landee, C.P. ; Turnbull, M.M. ; Ribas-Ariño, J.; Novoa, J.J.; Polson, P.; Wikaira, J.L Inorg. Chem. 2017, 56, 5441-54. "Ferromagnetic Exchange in Bichloride Bridged Cu(II) Chains: Magnetostructural correlations between ordered and disordered systems"